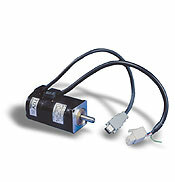 The SGMAH servomotor series has a low-inertia design for extremely fast accelerations and short settling times. There are five frame sizes including NEMA 23 and NEMA 34 flanges providing up to 1,010 oz-in of peak torque. 100 and 200 volt windings are available with rated speeds of 3,000 rpm and maximum speeds of 5,000 rpm. An 8,192 ppr incremental serial encoder is standard. The SGMAH is rated IP55 (not including the shaft). Options include a 65,536 ppr absolute encoder, NEMA flange, shaft seal, and holding brake.